As a fan of Lee Child’s Jack Reacher and Vince Flynn’s Mitch Rapp, I’m always looking for the next great hero to join their ranks. And Ryan Decker is just the character I’ve been looking for and more. He’s a highly skilled ex-CIA operative who has risked his life to save others more times than he can count. But after he’s framed for a botched raid, Decker loses everything—including his family. He’s condemned to a long prison sentence—until he’s inexplicably freed. Now Decker will stop at nothing to get justice for his family and take down those responsible for his ruin. 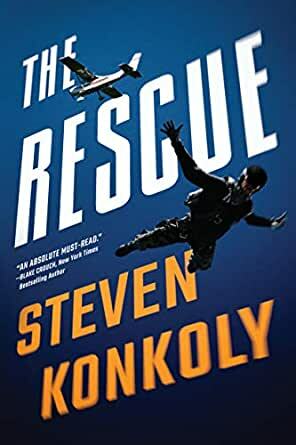 I was swept up in Steven Konkoly’s breakneck pacing. The characters and story felt so real and action-packed as I watched our hero skydive into danger that I forgot I was reading fiction. The Rescue delivers on every level. 5.0 out of 5 starsGrappling good read. Action packed, fast pace and thoroughly entertaining from start to finish. Now I am hooked by the amazing story telling of Steven K.